2. Cut each zucchini in half lengthwise. With a sharp knife or melon baller, scoop out the insides, leaving a 1/4-inch shell. Finely chop the flesh and reserve. 3. In a nonstick skillet, heat the oil. Add the onion and garlic, and sauté for 5 minutes over medium heat, until the onion is soft. Add the chopped zucchini flesh and tomatoes, and sauté for 2 to 3 minutes. Stir in the cooked rice, bread crumbs, chili powder, lime juice, and salt. Simmer for 2 minutes, until the flavors are well blended. 4. Fill each zucchini shell with an equal portion of the stuffing. Cover and bake in a casserole dish for 30 to 40 minutes. Serve hot with spicy tomato sauce. 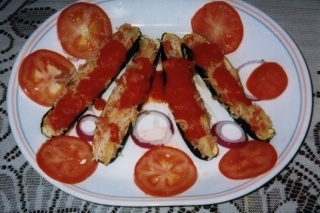 Flavorful zucchini shells are stuffed with rice and tomatoes and baked until tender. If you prefer you can substitute a combination of vegetables for the rice.